SoundCloud is a popular online music and audio sharing service where a lot of bands and musicians will post their music for others to listen to. Frequently they’ll include a download link to songs, but depending on the posters account, they often have download limits that can be quickly maxed out on popular songs. The easiest solution of course is to just buy the song, but that’s not always an option either, so that’s where this bookmarklet comes into play. 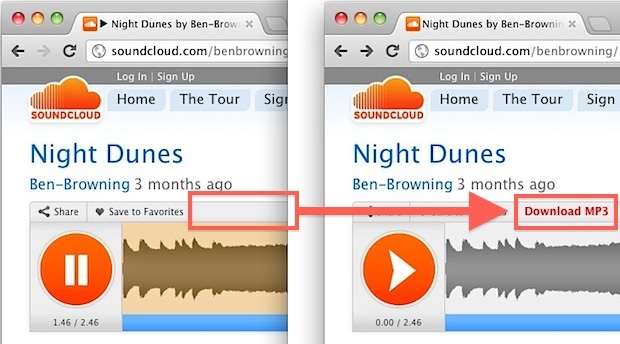 You can either just copy and paste the string below into the browsers URL bar while on a SoundCloud page, or save it as a bookmarklet that can be clicked on any SoundCloud page to activate the “Download MP3” button. Save the code above as a bookmarklet, or you can grab a Safari Extension. Just don’t expect stellar audio quality, because the songs are downloaded as 128kbps MP3s. That’s not a big deal if you planned on compressing the audio to save space on an iPod or iPhone anyway, but if you’re listening to the music on a high quality stereo you may notice the faint hiss and flatter sound of compressed audio. Heads up to HackerNews for the find. What is the Background Music in the iPhone 4S Commercials? Well… this feels wrong. As a producer and a user of Soundcloud I can say this is, for all purposes, piracy. You’re already given the ability to stream the music, if it’s not for download already it’s probably for sale. if you like it, buy it. Not necessarily Vanian. I want to download a track which has exceeded it’s download limit. The song is free by the artist, a cover in fact but can’t be downloaded anymore. No option to buy either. What to do in this case? Also Paul, the trick is not working for me. Made a bookmarklet. Don’t now what I’m doing wrong here. Thats why it is NOT POSSIBLE to download HQ. people use Downloadfromsoundcloud.com, extensions, software, audiorecordingstuff. If you really LIKE it, SUPPORT the artist, or make your OWN music, where you put your time and effort in, and let other people DOWNLOAD it for free! Well, that’s my meaning :). Aw come on.. piracy is just a reality. If it’s capable of happening, is it not going to happen? What is the point in trying to hide, obscure, or otherwise keep people from downloading things.. I’m an advocate of a free word where everyone is honorable and true to one another – treat others as you wish to be treated. I know it’s going to be hard for people to understand it’s not just a pipe-dream, but eventually it’s the way the whole world will be – one way or another. We all support one another, be authentic, and it’s going to be okay, nobody’s going to starve, or miss out on their fame, or whatever it is they need..
You’re kidding, right? Or else you’re 5 years old.